From Medieval England to the Crusades in the Holy Land comes a legendary woman of Magic and Might. In the days of Richard the Lionheart, Gwendolyn was born. Conceived within the Druid mists, at King Arthur's Legendary Pool of Pendragon and as prophesied by a Druid Priestess, she grew into womanhood, and became the most powerful knight the world had ever seen. When Miles Delong, Earl of Radstock and military adviser to King Richard first saw her, he was lost to her beauty and might. He taught her the art of war, but it was Gwendolyn who taught Sir Miles the art of love. Together, Gwendolyn and Myles fought their enemies both at home and in the Holy Land. But it was not until Sir Miles was treacherously given over to Saladin, the King of the Moors, that Gwendolyn left England's Druid Groves and went to the Holy Land, not as Gwendolyn Delong, wife of the Earl of Radstock, but as Sir Eldwin of Radstock, where she led the fight through the bloody Crusades and into to the very court of Saladin, that the Queen of Knights became a legend. What did you love best about Queen of Knights? I enjoyed the characters. They were fun and easy to relate to. The historical background mixed with mythology was fun too. 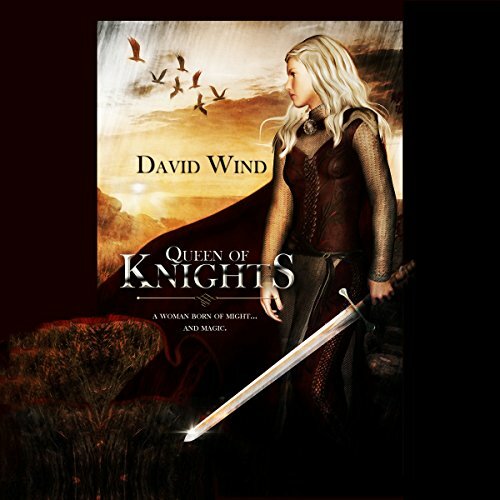 What other book might you compare Queen of Knights to and why? Can't think of any off hand. I definitely loved Miles the best. Who was the most memorable character of Queen of Knights and why? No one character sticks out for me. The book and characters were well written and even the bad guys were great. Good narrator with an enjoyable performance. Kind of a bad British ascent but that didn't hurt the story at all in my opinion. Worth the listen, inventive story! This book is well written, a bit Chaucerian and flowery in places, but it's period correct. I think this book should have been spread out over a few books do we could connect more with some of the characters, context and back story would have given more depth to the plot. This book does do something rather rare, it is a new idea while using Arthurian legend and other influences of the time. The difficulty was that since the book goes so quickly, you don't empathize with the characters and understand their deeper motivations. It ends up making the characters two dimensional, which is a shame. The writing is solid and details aren't missed, which is a real mood killer when an author forgets hair color or a character off on a mission. This book was provided to me, free of charge, for an unbiased review. I received this book from eblast, and this is my unbiased opion. good story, a little bit predictable. but a few twists I did not see. believable characters. I enjoyed this book a lot. The whole idea that a woman can defeat the greatest knights of that time. Quendolyen. She was a powerful character. Yet female. It was a fantasy story, but a good one. The whole idea of being born from a god lying with the mother, so I guess she was a demigod? Hollie did a good job. Fine amount of emotion and carried the story. A post-Arthurian tale with a bit of a twist. Gwendolyn is born from mystery and mists of the Pool of Pendragon. She is secretly trained by her mother until her death and then by her husband to become the greatest night in the British empire. When Miles of Radstock is given to Saldin, sultan of the Moors for revenge, can Gwendolyn save her husband so that her legacy is safe and her destiny can be fulfilled? This is an intriguing read with a thoughtful plot and fully developed characters. Some of the conflicts. 'joining' and fight scenes get a little repetitive but, overall, it kept me engaged and I was entertained to the end. Gwendolyn is truly a fearsome creature to behold and one not many men would go up against! Richard is nuanced as I haven't seen before and even Robin Hood makes an appearance and assists our heroine. In short, there is much to entertain and divert in this listen. The narration was good and I enjoyed Hollie Jackson's ability to perform the dialogue. Prophecies, Battles, Druids, Deceit, Good, Evil, Betrayal, History, Magic, Myths and Love. All of these elements and more are combined with Historical figure's and woven into a really good, well written, interesting, enjoyable and entertaining story. Intertwined with mythical and magical element's. Gwendolyn's birth was told by prophecy as was her destiny. To be the Knight who wields the silver sword. The story moves along at a pretty fast pace and there is a lot that happens. Even though the main character is a women in a medieval setting there is plenty of action and detailed battle scenes. It is nice to have a strong, confident and intelligent female lead especially in a medieval story. This is the first book by David Wind that I have read, but it will not be the last. He has made a fan of me. Hollie Jackson has a nice smooth easy to listen to voice. She did a good job on this story. I have listened to several other books she has narrated and done a great job. For this story she may not have been the right choice. Even though the story's setting and the character's are in England the character's have only a slight English accent this pulls you out of the story somewhat. For me this is not really an issue, but I know for others it is. There was too much repetition, too much of the action was 'pre-ordained' or foretold by prophecy which actually took a great deal of the surprise out of it. It definitely needs to be read as fantasy rather than historical fiction, as so much of it defies belief. But the story is filled with tension and there is a good, strong heroine which is always a plus. If you’ve listened to books by David Wind before, how does this one compare? I haven't listened to any before. What didn’t you like about Hollie Jackson’s performance? Simply put, the book is set in England and all of the characters were English, and yet the narrator was American. Unfortunately, her attempts at an English accent resulted in everyone sounding like a bad copy of Joanna Lumley. And the cockney Druid Priestess was really awful. Was Queen of Knights worth the listening time? Yes and no. It wasn't a terrible story, but I think the performance let it down.